Android 9 is officially here and we would be remiss not to mention our slight disappointment at the Pie moniker. Don't get us wrong, pie sounds perfectly mouth-watering and playful, but perhaps just a bit too plain for an Android name? Considering the track record so far, that is. Also, not using the π symbol, just seems like a massive missed opportunity. Anyway, naming aside, there are some really interesting new features to look forward to in Android 9. That being said, "new" is rather relative here. Google's development process for Android is becoming an increasingly open and feedback-based one. More than anything, however, such a large mass of people is paying close attention to the dev process, nowadays, that few things can truly come as a surprise in a new release. Still, now that Android 9 is officially out of the beta channels and making its way into the general public, we wanted to take the opportunity to go through some of the main additions to AOSP in more detail and see just how much they have changed/matured, since our review of the first Android P public beta. Spoiler alert, If you've been keeping up with the development of Android 9 over the past few months, there's nothing really new or shocking coming up ahead. 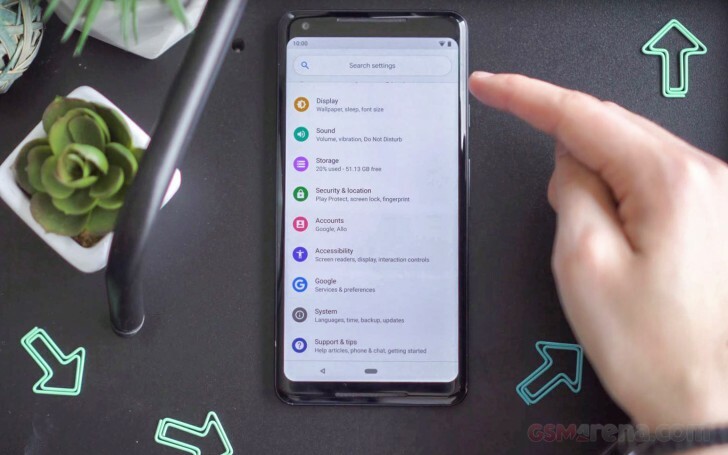 So, to spice things up further, we also took the liberty of re-running our standard set of benchmarks on a Google Pixel 2 XL unit, running the latest public Pie build. We also wanted to see just how much effect on the battery endurance the OS update has. So, we ran our standard endurance routine on the Pie-infused Pixel 2 XL, as well. If that piques your interest, join us on the following pages, as we delve into the first public release on Android 9 Pie.